Crafty Teacher Lady: Rug Sale! 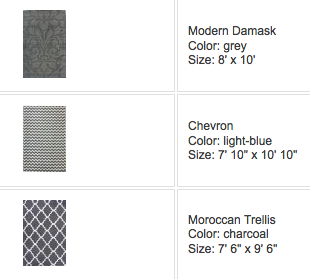 I've been shopping for area rugs ever since moving in to my new house almost one year ago. I haven't purchased any since they always seem sooo expensive and I just couldn't commit to such a big purchase. This morning I happened to be browsing online and came across RugsUSA.com. 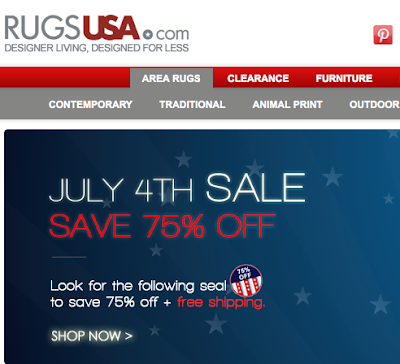 Turns out they are having a HUGE Independence Day sale and a large selection of their rugs are 75% off PLUS free shipping!! I jumped on the chance to outfit my living room and bedroom with desperately needed area rugs! I actually ordered three rugs but they were so inexpensive (just over $500 for three large area rugs) that I couldn't pass up the deal! I consider it a 'happy one year living in my house' present! Obviously from looking at these rugs it can be deduced that I love the color gray! I would rather keep my rug purchase a neutral color since I can always paint walls or add smaller, less expensive accessories to add pops of color. They should be here in a week or two...fingers crossed that they look good! How did you like the rugs? Good quality? Just checked out the site, loved the designs. I LOVE them! Very good quality and colors...I get lots of compliments! !